Mahaiwe Performing Arts Center, Great Barrington, Mass. 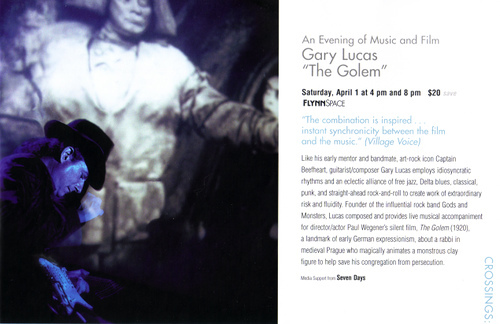 - Gary Lucas plays "The Golem"
The Future of Music Conference at Pop Montreal, McGill University, Schulich School of Music, 555 Sherbrooke Street West, Montreal, Canada - Gary Lucas is a panelist, "What's Wrong With Music?" 9th Hope and Dreams Film Festival, Hope Community Center, Hope, New Jersey - Gary Lucas' original score and interview featured in award-winning documentary film maker Slawomir Grunberg's "The Legacy of Jedwabne"
Washington DC Jewish Community Center, 1529 16th St NW, Washington, 20036 (phone: 202-518-0248) - Gary Lucas' music and interview featured in Slawomir Grunberg's documentary "The Legacy of Jedwabne"
Sid Jacobson Jewish Community Center, 300 Forest Drive, East Hills, NY - Gary Lucas' music and interview featured in Slawomir Grunberg's documentary "The Legacy of Jedwabne"
Gary performs at the Glenn Kenny/Claire Elizabeth Evans nuptials, Big Indian, New York - Glenn is a senior editor at Premiere Magazine, has written for The New York Times and Rolling Stone, and wrote the liner notes for Gary's compilation album "Operators Are Standing By"
The Flynn Theater, 147 Main Street, Burlington, Vermont - Gary plays "The Golem", click here to see the blurb!